Eugene Grant QC has been a barrister in criminal practice in Northern Ireland for a number of years. In addition, he is founder and secretary of the Criminal Bar Association (NI) and was Chairman of the General Council of the Bar of Northern Ireland for the period 1996-98. As a participant in the Criminal Justice Review, I strongly supported the devolution of Justice to Northern Ireland as a welcome opportunity to play an important role in shaping the future legislative system. More than a year on, it is disturbing to see that the new Department of Justice is intent on undermining independent advocacy in the criminal justice system. Despite the headlines, this dispute is not about money—it is about the survival of an independent system of justice available to the general public equally regardless of currency, class or creed. 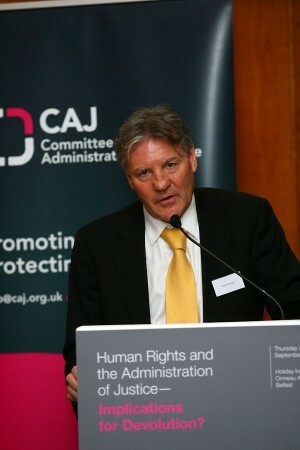 The present dispute is the thin edge of a big wedge— the suggestion of ‘compliant’ as opposed to independent lawyers; the introduction of bringing in legal representation from England and Wales and other unknown ‘options’, serves only to demonstrate the true intention of undermining the whole legal system and introducing a two tier system of justice. When an individual is charged with the most serious of criminal offences and places his whole life in the hands of his legal representative before a Jury for over a month at trial, it takes many years of training and experience in order to provide the level of representation required, both in terms of prosecution and defence. In these austere times, indeed at any time it is quite right to continually review the legal aid budget. However, while pursuing value for money, we must give equal and due regard to the inevitable consequences of crude budget cutting without proper supporting evidence. It should be noted that England and Wales are currently reaping the ruinous outcome of such an approach resulting in widespread criticism from Westminster, the public accounts committee, the Judiciary and the Attorney General.